They were even walking up the last one and even Ian didn't have to do that. Anyway a race would have been a non event as it transpired (we finished over 2 hours before them). We also passed an elderly women (guessing mid 60's) on her 19th day, solo, no support, carrying her supplies. She had done South of France last year and was already planning Ireland End2End for next year. What a lady! We then had a shock - Wick. Not having seen a roundabout, traffic light or anything other than 10 house villages from Inverness, imagine the surprise when we came across Wick. Out of town shopping, Tesco, Argos Extra, B&Q, New Look, as well as traffic lights. It had everything. 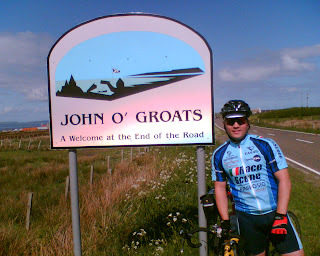 Through Wick for the final 17 miles, a few nasty little hills to shatter any thoughts that you had finished and eventually the drop into John o'Groats.